Total Weight Gain: 30 lbs. (whew...that means I gained about 6lbs in the last 4 weeks! Yikes!) And trust me...this picture is somewhat deceiving...I think my belly looks much larger in person. Maternity Clothes: I'm now wearing mostly all maternity clothes. I still have a few maternity dresses that I'm wearing but the mornings are starting to be a little too cool for dresses. Movement: I seriously think she is trying to crawl out of my belly at times. And, I'm starting to wonder if she sleeps much because it always seems like she is moving. This pregnancy is so different than it was with Cain. 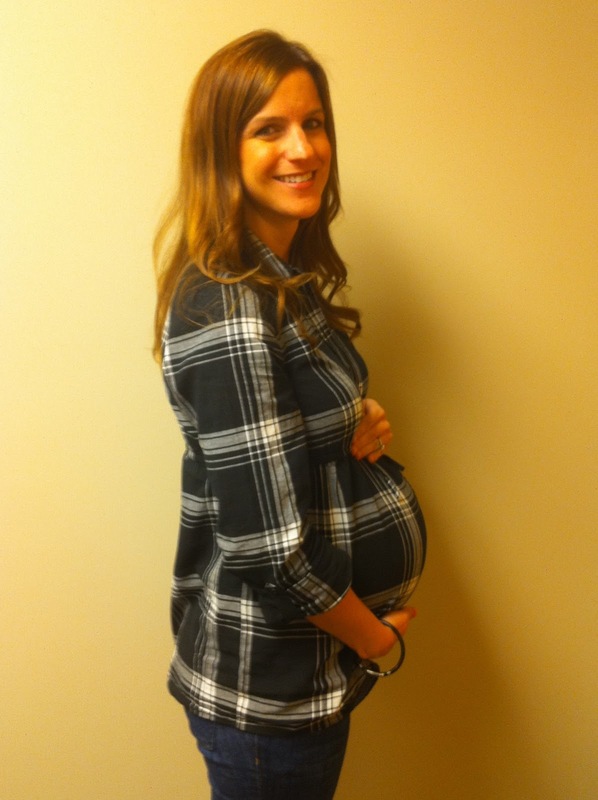 With Cain, my placenta was towards the front of my belly so I didn't feel him move as much. I've enjoyed getting to watch my belly move around. Sleep: I now wake up many times throughout the night. It has been difficult to get comfortable. I sleep on my left side and started using a small pillow under my belly this week which has helped some. I have to get up at least once a night for the bathroom and I seem to get hot a lot during the night. And I've now learned to just keep TUMS on my nightstand so I can reach them during the night to help with heartburn. What I miss: Being able to pick things up off the ground with ease! Cravings: None really. I've noticed that I'm still eating a lot of cereal (mostly Frosted Flakes) and I'm actually drinking chocolate milk once or twice a day. This is huge for me because I've always hated milk. I can only drink skim milk and it must have chocolate syrup in it. Best moment of the week: My baby bedding arrived today!!!! And I had an OB appointment so I was able to hear the heartbeat. What I'm looking forward to: Picking out furniture for the baby's room and maybe purchasing a glider for her room. I love it!!! 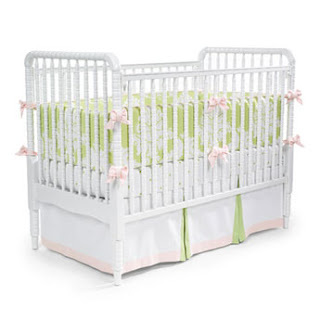 I think I going to use some of the Target gift cards we received after the flood and buy a white Jenny Lind spindle crib (just like in the picture). And look for a cheap dresser on Craigslist that could be painted and distressed. And of course the walls will be a light pink!! I can't wait! Hopefully we will be back in our house soon after she is born so I can enjoy decorating her room. YOU LOOK AMAZING!!!! 30lbs...whatever. They must put brick on the scale when get on. But seriously I love the bedding. So girly and sweet. It will look beautiful in her new room in her new house. Hope all is well. You are the tiniest pregnant girl!! I love the new bedding...very cute.